The HP C5240 printer is reliable, fast and capable of excellent prints. Undoubtedly your HP C5240 will consume all of your printer ink, and when it finally happens you'll soon notice that replacing HP C5240 ink is often an expensive affair. You have no reason to worry about shelling out the steep purchase prices you'll discover on the high street because here at Cartridge Save you can find all the HP C 5240 cartridges you will want at seriously low prices. Save a lot of cash on your ink by purchasing online at Cartridge Save! You don't need to pay the high cost of a C-5240 original cartridge or C5240 compatible ink in the main street when you can save a load of money ordering with Cartridge Save. You get full satisfaction when you purchase your PhotoSmart C5240 ink cartridges from us because they are covered by a straight forward money back guarantee. Remember that every order comes with free delivery, mostly arriving at your door on the following working day! When choosing a new printer, it can help to understand just how many options are available to you, options which include the HP Photosmart C5240, a printer which has something of a fine reputation these days thanks in no small part to the many features it possesses. The HP Photosmart C5240 is a printer which needs no introduction, so here is a brief low down of its finer features. The HP Photosmart C5240 is a simple item in design terms. An unceremonious white finish is complimented by a very easy to use interface, something which every fine printer should offer. What's more, the HP Photosmart C5240 is put together in a very simple yet style-orientated manner. The smooth curves which have become synonymous with the Photosmart range are present, as are a range of quality features. A key advantage of the HP Photosmart C5240 is the sheer quality of print outs it can manage within a short space of time. Put simply, the HP Photosmart C5240 is a printer which excels in this department, something not every home printer can boast. The HP Photosmart C5240 comes complete with handy scanner function and even boasts a photo-specific print tray for easy creations. There are hardly any to mention as the HP Photosmart C5240 has been on the market for some time. 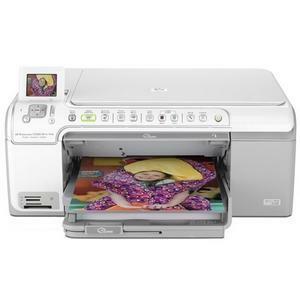 Thankfully, it won't cost the earth which means that the HP Photosmart C5240 is an affordable and effective printer. All in all, there is nothing about this printer which could disappoint.